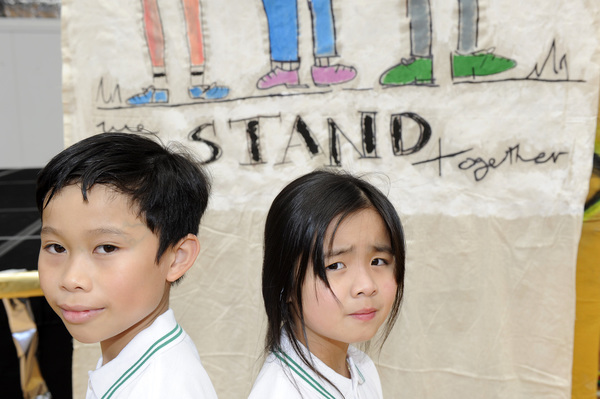 Springvale students created their own anti-bullying campaign, complete with a music video. Athol Road Primary hosted a launch for the Students Create the Future (SCF) project on Monday 28 November. Assistant principal Carmel Nigro said the school had been working with Resilient Youth Australia, clinical psychologist Andrew Fuller and The Resilience Project to build resilience in students and promote positive mental health. She said that according to Mr Fuller, strengthening student voice and increasing empowerment was one arm of building resilience. So a small group of Year 5 and 6 students planned and implemented their own SCF project, with the aim of making a difference to their school, community or world. “Because SCF is a 100 per cent student-driven initiative – without any influence or steering by teachers – it completely opened the creativity of students and allowed them to explore diverse ideas which fostered an ‘anything is possible’ approach,” Ms Nigro said. Springvale students from diverse backgrounds eat, drink, play and study together, demonstrating a moving lesson in inclusion. She said it took a while for students to shape their ideas into a manageable project. “After much rich discussion and exploration of wonderful possibilities, the students decided to tackle bullying by writing and recording a song along with a film campaign to build the awareness and send a clear message to the community and beyond about creating a sense of belonging,” she said. Students engaged the school community in designing a logo and slogan for campaign T-shirts – we stand together! “The important part of the SCF process was allowing students to truly steer and create a project in an authentic and meaningful way,” Ms Nigro said.